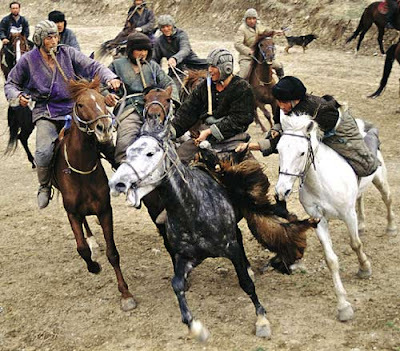 Kupkari, (also known as uloq and buzkashi), is a wild, traditional sport played on horseback throughout Central Asia. The Uzbek annual spring kupkari tournament will be held at Samarkand's hippodrome this year on 25 March. Central Asian equestrian skills are legendary and kupkari today demonstrates that outstanding horsemanship is still highly valued. The goal of a team or individual player is to grab the carcass of a headless calf or goat, then get it clear of the other players and pitch it across a goal line. As Wikipedia notes, 'kupkari is often compared to polo. Both games are played between people on horseback, both involve propelling an object toward a goal, and both get fairly rough. However, polo is played with a ball. The animal in a kupkari game is normally beheaded and disemboweled and has its limbs cut off at the knees. It is then soaked in cold water for 24 hours before play to toughen it. Occasionally sand is packed into the carcass to give it extra weight. Though a goat is used when no calf is available, a calf is less likely to disintegrate during the game'. Sometimes there are more than 100 stallions and riders caught up in the mêlée: the riders and horses must be smart and experienced to handle the excitement. An old saying 'better a poor rider on a good horse than a good rider on a poor horse' echoes the importance of the mount in kupkari. Horses are trained never to trample a fallen rider and to swerve away from collisions without a gesture from their rider. To enable the rider to pick the calf from the ground, the best horses will push and ram their opponents, forcing their way into the middle of the fray around the starting circle. But when a rider makes the perilous reach down to grab the calf, his horse will stand perfectly still, waiting for the real action to begin. Prizes can be significant, such as a car, and although strict rules govern the sport, the competition is fierce and rough. (Riders often wear old Russian army tank helmets). 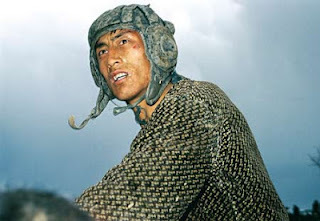 Theodore Kaye's series on buzkashi (kupkari) riders in Tajikistan, which won a gold award in the Paris 2011 Prix de la Photographie and a 2nd place in the International Photography Awards, captures the atmosphere of this game. As well as the chance to view this ancient sport, many other traditional activities will be on view in Samarkand: qiz quvar (girl catching), belbogi kurash (wrestling), ot ustida kurash (wrestling on horseback), darboz (rope walking), clowns and Uzbek dance and music.